Can Failure at the Photocopier Define your Day? The next time you’re queuing at the photocopier, ask those in line if they’ve ever sworn at it. They’ll either look at you and leave (giving your more time to negotiate the 2:1/1:2 paradox) or they’ll lie! In his ebook – The Anger Solution – John Lee suggests that exhaustion and tiredness can lead to regretful actions such as raging at slow ladies and swearing at photocopiers that run out of paper (page 57). Based on the fact that most teachers are always exhausted, does this mean that my irrational response to a horrendous copier experience is – in fact – totally rational? Take out the obvious terrible events that life can – and does – so cruelly throw at us. I’m pretty sure that running out of paper (especially A3 which is massive and bendy! ), getting your job ‘interrupted’ or the engineering PhD required to fix the paper-jam are – during that split second – the worst things that can happen to a person. Add the fact that your class are lined up in an empty playground and fronted by your Head-Teacher who only this morning ordered a ‘push’ on punctuality… and you might as well cancel the day. Traumatised by a nightmare at the photocopier? Be sure to contact us. 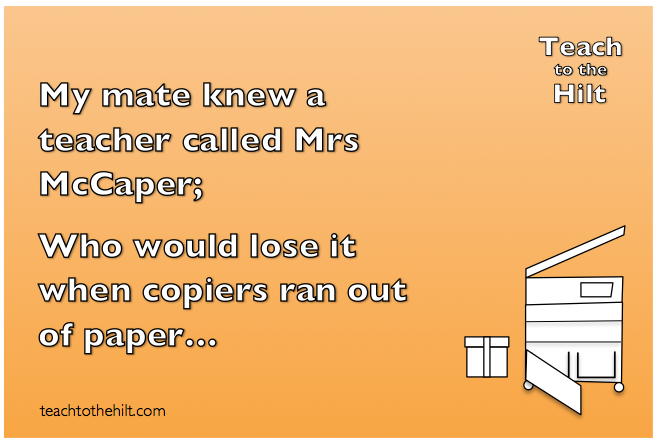 We’re sure it can’t be as bad the the tragic twist-of-fate suffered by Mrs McCaper!? Who would lose it when copiers ran out of paper. From around all the boxes where new paper stands. She exploded and violently shot through the roof! And became a copier engineer! Don’t you dare take those scissors from out of that room!